February 2018 - Sawtooth Mountain Maple Syrup Co.Sawtooth Mountain Maple Syrup Co.
It’s common to be asked by our neighbors who know us and our woods-work these wonderful questions. And we love to answer them because we are so passionate and exited about our sugar farming. So how is the maple syrup? 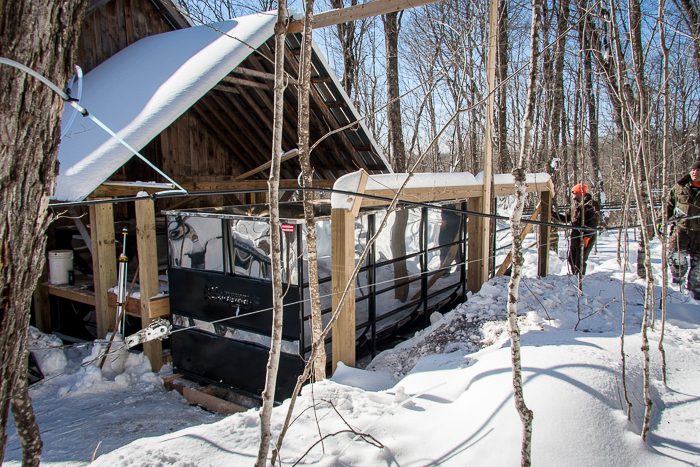 Well there is some exiting news to talk about in this blog and forthcoming blogs; about what’s new in the sugar bush, and what’s cool about our current and new customers. In January (on the 23rd precisely) Chris, Kirstin, Calvin, Ian and Greg charged up their drills, shouldered their tap packs, rallied the dogs and marched out of the sugar house to begin the task of tapping 24k+ trees. We can attest that there have been some incredibly beautiful winter days and some, well, down right exotic days. Brrrr! Below watch Kirstin at work tapping maple trees. As of today 99% of the sugar bush is fully tapped and we are in the preparation stage to our seasonal harvest. Dropping off the tank at the sugar bush. A big thanks to local mechanic Joe Hall … Like a boss! One new addition is here! 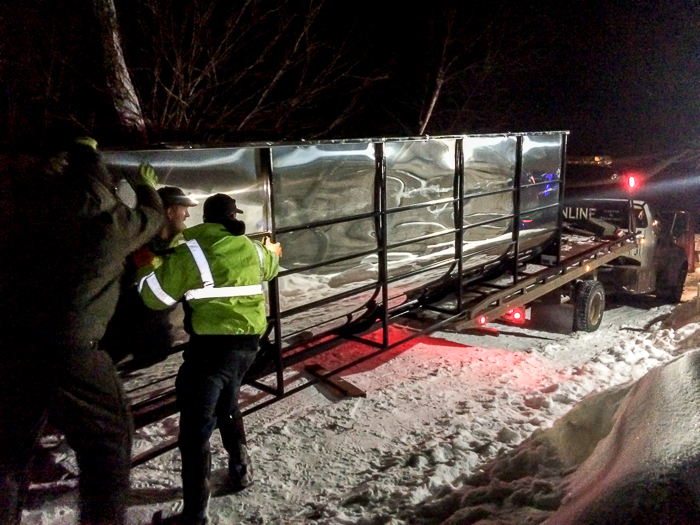 You may be interested to know of the arrival of a new 4800-gallon sap tank. It was delivered two days ago and installed on Thursday the 22nd. In the coming days Chris and Calvin will finish the Sugar House extension with a metal-roofed canopy that will cover both the 4500 tank and the new 4800 sap tank. Hook up the plumbing and “Bob’s-your-Uncle!”. Now we’re talking capacity! If I may suggest … On your next visit to Minnesota’s northland, stop by Wild Country’s little store for a bottle of Pure Maple Syrup and other fun things – it’s always open! 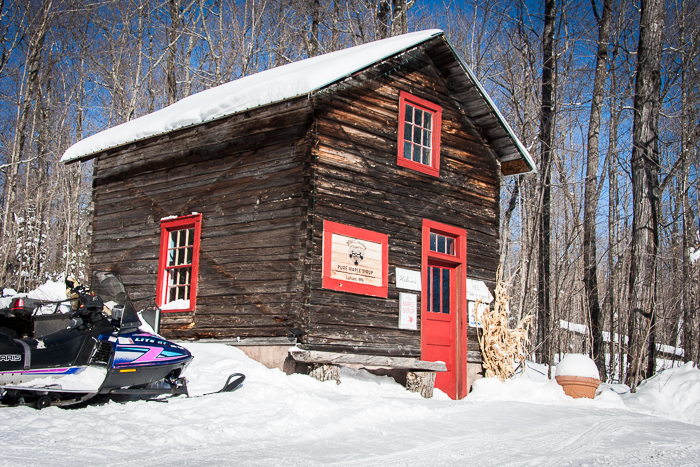 Snowmobilers can easily zip off the State Trail on their way up or down the shore to visit our farm – the trail crosses our driveway. If you like snowshoeing there’s plenty of trail blazing to be done (and appreciated) just send us a note if you’re up for the task. I’d keep the cross-country skiing to the trails but after, come enjoy our farms marvel of tubing and taps while you snack on a maple caramel or pick up a bottle of Minnesota north shore country maple syrup. As I write the maple blog today, abundant snow-fall graces our North Shore again adding another foot or two to our snowpack. The winter won’t be long lived as we hear often the Pileated woodpecker drumming and the Chickadees singing their spring song to the increasing sun’s intensity and the longer days. Life is on the way again in our frozen land – Just give it a couple weeks and the trees will be awake giving their sweet nectar that we will transform into a delicious treat to top your pancakes or lattes!